We had an incredible time camping with the kids last week! Sure, I might have a few more gray hairs courtesy of trying to teach my two-year-old to stay away from the fire pit, but overall this is something I think we need to do every year. When you think of camping food, there’s the usual hot dogs and s’mores (which we made both nights! ), but there are plenty of other yummy meal ideas. On our second night camping I made fire roasted sweet potatoes for everyone. It’s a well-known fact that everything tastes better when you’re camping, but these tasted even better than that! Plus you don’t need a camp stove to cook them, and they don’t create dirty dishes or pans to wash. Yay! The easiest way to do this is to prep your sweet potatoes at home. I washed them and pierced them with a fork, then left them on the counter to dry completely. Once dry, I wrapped them up tightly in tin foil. That way they were ready to go whenever we wanted. Build your campfire and put your sweet potatoes around the base of the fire. Don’t put them directly in the flames. Medium sized sweet potatoes will take between 50 to 60 minutes to roast all the way through. Turn your tubers after half an hour to let them cook evenly. Once they’re soft all the way through, carefully pull them out of the fire. I used our hotdog roasting forks for this. Let them cool for a few minutes then carefully unwrap the foil. Cut the sweet potato in half, throw on a pat of butter, a pinch of salt, and a few pieces of marshmallow. I just cut up the regular marshmallows we brought for roasting, though mini marshmallows would be great too. Close the sweet potato and loosely wrap the foil back up for a minute to let the butter and marshmallow melt. Leave it in the foil and you probably won’t even need to wash the plate. Enjoy! Wash sweet potatoes and pierce with a fork. Wrap tightly in tin foil. Roast in fire pit coals for 50-60 minutes. Turn halfway through. When sweet potatoes are soft all the way through, remove from fire. Cut sweet potato in half and add butter, optional marshmallows, and a pinch of salt. Close potato up for a minute until butter and marshmallow are melted. Serve hot and enjoy. These sound delicious, you know I have made white potatoes in the grill, but for some reason never thought of sweet potatoes, thank you fro reminding me. Oh yes, they’d work great on the grill too! Sounds yummy! We did regular potatoes with onion, on the fire a couple weekends back…..very tasty! Thanks, Kathy! 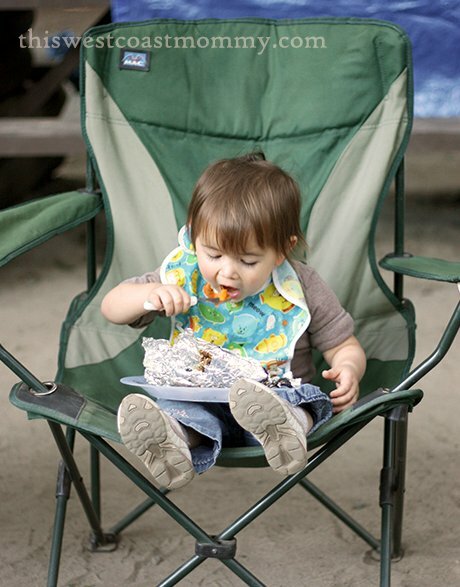 She loved eating her sweet potato like a big girl in Mommy’s camping chair! I’m totally obsessing over sweet potatoes recently, and this would satisfy the craving for sure. Plus adding in the bonfire would only make it THAT much better. 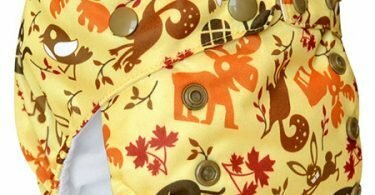 Thanks so much for sharing at DDT; I’ve pinned this recipe! I love sweet potato! This is a great idea for camping. Thank you! This sounds so delicious and so easy! I may try this in the oven since we don’t camp!! Thanks for the recipe….pinned! Oh my GOSH, that sounds good. Maybe I can do this on the grill or our gas stove? Haha I want them before the next time we decide to go camping! Omg! That sounds so delicious! I could even do this I’m our backyard fire pit when we have family get togethers!!! Awesome! Thanks! Omg these look so good! This is a great idea for camping and gives something different other than typical hotdogs and marshmallows! 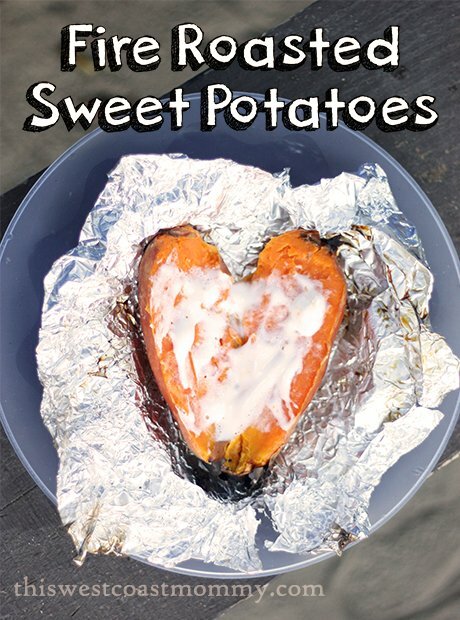 These look delicious and I am going to try them on the grill soon.We love sweet potatoes and I am so glad you posted this to remind me to do this. Yumm! 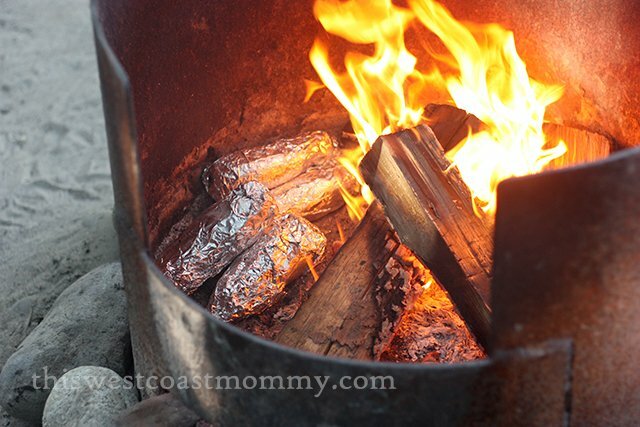 I’ve never roasted any kind of potato in a camp fire before, but it looks pretty darn easy, tasty and warm! These look delicious, and simple enough to make. Thanks so much!! It’s been years since we’ve been camping. I love it, but my husband…not so much. That picture of your little one is absolutely precious! We’re big sweet potato eaters here. Even if I can’t make it camping, the oven, grill, or the fire pit out on the deck will work! DROOL!!! I LOVE sweet potatoes so much, but wowza, this looks to die for!! Can’t wait to try this!! Thanks so much for sharing with us at Delicious Dish Tuesday!! LOVE!!! I cannot believe I never thought to use a sweet potato 😉 Thanks for the idea – I’m planning on using the recipe for our next bonfire/campout! What a unique recipe to use camping! The photo of the child above eating up the sweet potato says it all! Love sweet potatoes and finding new ways to use them. Although they are great with something sweet, we also love them chopped up and tossed with a little olive oil, garlic, and herbs. Its a nice compliment to the natural sweet flavor. That is an interesting recipe. I would never have thought of adding marshmallows. Omg, these look so good! I think I would love them as much as the kids!! Never thought of this! Great idea for next summer! Will have to remember this! This looks and sounds so good! I think my boys would really enjoy it. We’re definitely going to try this! These llook so yummy We will def be making trhese! Looks good, We’are definitely going to try this!